Welcome to my new blog. To thank everyone for stopping by, I am going to give away prizes to three lucky winners. To enter, simply leave a comment on any of my recipe posts, become a Hungry Halloween blog follower, or subscribe to the Hungry Halloween blog. You can receive multiple entries for doing all the above and for leaving comments on more than one recipe post. Rules: You must be a US resident 18 + years to win. Winners will be announced on June 25th. Good luck, Beth, with your blog and book. The chocolate bucket looks great! Please count me in. I would love to much on the chocolate and read your book while I am recovering from my surgery. After all, everyone knows that chocolate makes the "owies" go away. I hope you are feeling better soon. My prayers are with you while you recover from your surgery. You are right chocolate does make all the "owies" go away! I'm a new follower! I love Halloween so I can't wait to see your great ideas! Welcome Allie. Thanks for joining my group. I just checked out your blogs and they are great. You must really be busy in the kitchen. I commented on your Creme Brulee P-Eye post! I'm a new follower and I'm looking forward to reading more! Welcome, Pat, Mamforeverandever, and Amber. I hope you enjoy making the recipes I've posted. I love your blog. What creative ideas. I'm your 16th google friend connect follower - kycouple2000. The were wolf cake is delightful. I love all things chocolate and your site is one I've book marked for future reference. Because of migraines, I can no longer eat regular chocolate. Boo! The white chocolate prize, however, is another story entirely! Good luck with your new blog! I just found your blog, and I love it! I'm following publicly. I just subscribed with Google Reader too. I CAN NOT WAIT TO TRY YOUR RECEPIES.. MY MOUTH IS WATERING JUST READING THEM!! YUMMY! What an interesting and unique blog! I look forward to reading your posts. I commented on your vampire pizza post. I follow your blog (SunnyDreemz)! Awesome contest -- and awesome blog. I love Halloween! Welcome Peg, KY, Tracey, Mverno, Sarah, Carol, Julianne, Lily, Alicia, Sunny and Jennifer. I'm happy to see so many new followers here at Hungry Halloween. Am now a google follower. Clicked on the Creme Brulee Eye Pie and jumped it is so realistic and sounds absolutely fantastic to eat. Hope you are doing well. Think Halloween in June is a fine idea. Sort of breaks up the routine. Ha! Ha! Hope the postperson brings me some chocolate covered pretzels here in the Poconos. im a blog follower- great giveaway and cute blog! Yummy treats! I subscribe via google reader. Welcome Mensa63, Mary, Courtney, Tamatha, the Taylor's, AEKZ2 and Kimberly. Wow, thanks for ordering 8 books Mary. I hope all of your friends enjoy the books too! I love Halloween! MY husband loves chocolate! Thanks for a chance! I've subscribed to your blog! Google friend follower (hope the widget works this time!). I commented on your recipe Cackling Crackers and Full Moon Dip! YUM! I commented on your recipe "Count Pizzala!" Thanks for a great contest and a great blog! I'm a new follower! I'm going to bookmark this page because I love Halloween and can't wait to try some of your ideas! New follower via GFC, thanks for the chance! Great blog! The Vampire pizza sounds great!! Sounds awesome! I follow via Google. I have never even heard of chocolate popcorn! 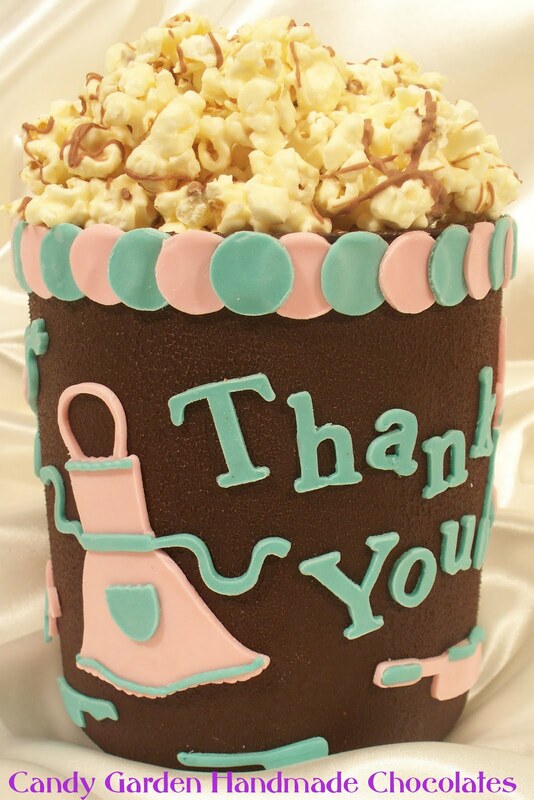 The chocolate popcorn looks sooo-- good! How fun to win one of these special prizes. First time to your site but really like it! I'm a Huge Halloween freak! I'm a new follower now and popcorn is always welcome in this house. we love our popcorn for sure! My granddaughter would love making the Count Pizzala, though she might want to exchange the black olives for green which would make for an interesting hair color. Would REALLY love to own this book! So wonderful. I think you have moved into the next dimension with this. Hey Beth! Congratulations again! Not sure if my first comment posted but I follow you on FB! I am a follower via GFC. Your blog is cool. My kids would love the werewolf pops! WOW, so many people to welcome. I am so excited to see so many new followers. I'll post the winners to this contest tomorrow. Good luck to you all. I'll also post a new Twilight inspired recipe! Halloween Recipe - Excerpt from the Movie Monster Munchies chapter of Hungry Halloween. You have a lot of cool recipes on here! Hi I am a new follower. I love your recipe's Halloween is my favorite holiday! I'm following on GFC. Great blog! I a new follower and love the recipes. Thanks. subscribe in google reader, thanks! I commented on the CREME BRULEE P-EYE! Thanks! Hey, I went to the Eclipse premiere at midnight last night, and I want to report that Edward Cullen looks just like your quesadilla.